As the nights have passed their longest, I have become fixated on hellebores, desperate for a glimpse of snowdrop, or waft of witch-hazel. My garden is not a good winter garden. I stalk the bounds poking into the earth where I have no business. I’m poking for proof of life. No matter what evidence I see on woodland walks, nothing convinces me that Spring is really going to come like the acid green shoots of crocus and scarlet peony prongs, which are the first things to show in this garden. It takes enormous willpower not to probe down into the soil for proof, and although I’ve resisted this year, it’s not always been like that. I just want to see what’s going on down there. The unspoken of this is of course, that I have doubts. A sceptical part of me evidently believes that we will be stuck in winter forever. But I hope—despite the terrifying, apocalyptic news of imminent ecological collapse—that somehow things will survive. Spring will still come. Persephone will come out of the dark, return from the dead, and the world will keep turning. And turning to more cheerful thoughts (trying to keeping looking forward as well as back, in the best tradition of January) we made some proper garden progress over the Christmas Break. Some significant work has been done on the decking, and though it’s still quite far from finished, I’m optimistic that I’ll be drinking tea on it when the better weather comes. We’ve also built Another Bed. This is the bed that edges the pond, the one which will contain the Firework Border, and which holds the magnolia stellata. We bought and planted the magnolia in the summer of 2016, shortly after we moved in, long before we had a plan. I’d had to leave a much-loved magnolia in our last garden, so this, a dark purple wisteria, and the four ceanothus bushes were early promises of the work we knew we would do. 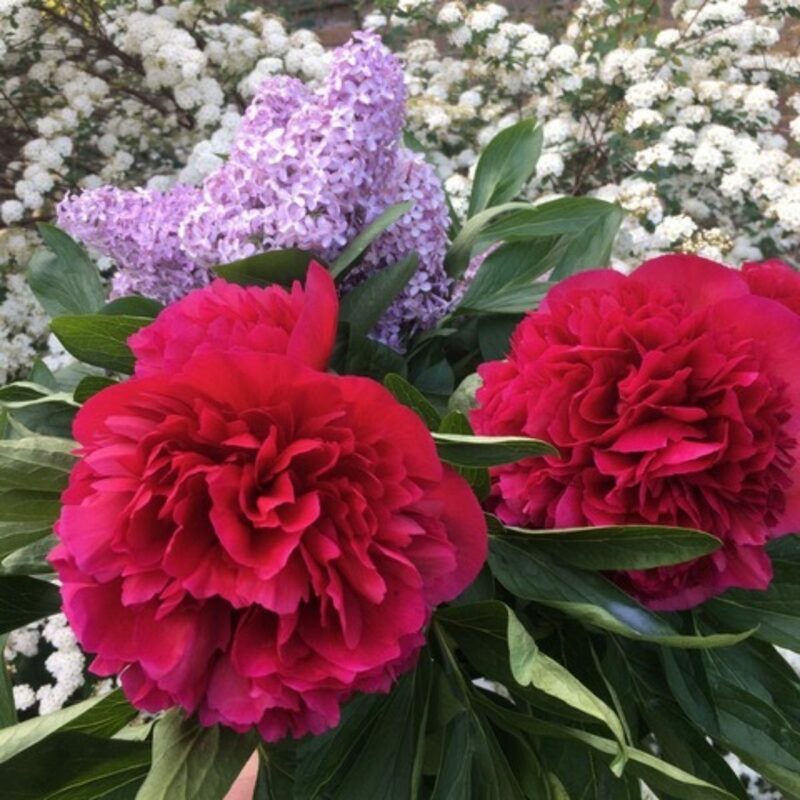 We brought three peonies from our previous garden, two Sarah Bernhardts and a Black Beauty, and have planted one of each in the bed. Earlier in the year we split into quarters the Old Monster, the colossal, forty-headed peony that reigned over the raspberry patch. The white peony that we discovered after felling the holly is a Duchesse de Nemours, that’s gone in too, into the Peony Bend. Last spring my sister-in-law sent me three roots of Coral Charm. I thought that they’d perished in the summer heat, but a bit of illicit prodding soon told me the truth. Behind the peonies will go the dahlias but not until May. At present, they are all tucked up in their winter beds in the utility room. Behind the dahlias will (we think) go a lilac. I’m interested in finding the unusual Wedgwood Blue, or maybe a lavendery Leon Gambetta, but I could also be tempted by the glorious double mauve-pink Katherine Havemeyer. I adore lilac, and though there’s a small bush in the lane that leads up to our house, I am happy to give up precious garden space. 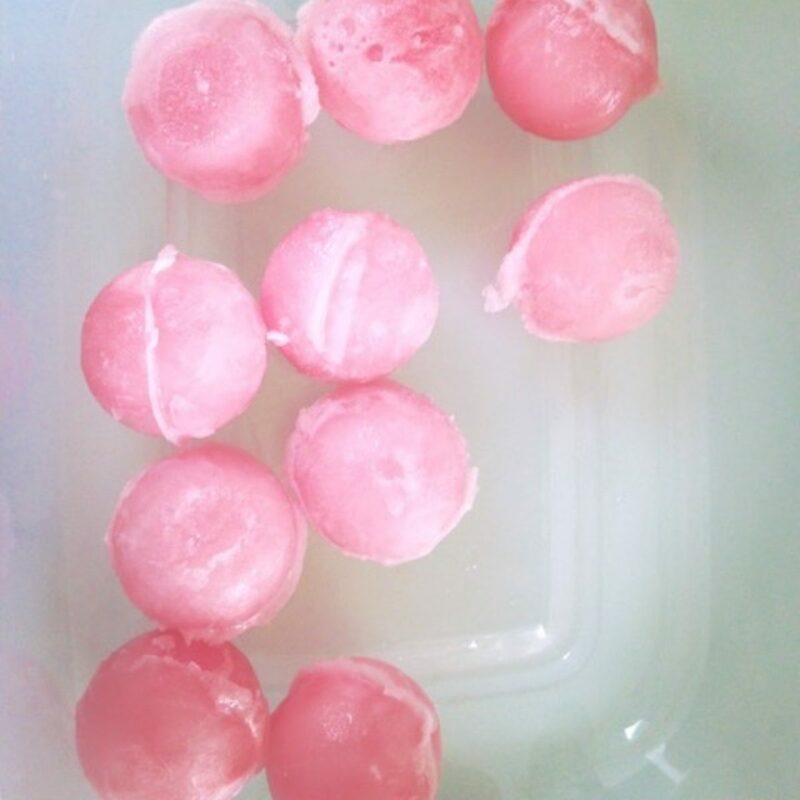 Every year I freeze lilac syrup into balls for sherbety summer drinks, they never fail to win a gasp of pleasure from guests. Before the year turned, I planted some more tulips. They are late, but not the latest I’ve ever planted, so my fingers are firmly crossed. Next autumn, I will be digging a trench in the other New Bed to accommodate my tulip fetish, but this year I have mostly been confined to large planters, apart from this very late set. They are what I call the Rescue Tulips: bulbs from a couple of years ago that have survived and gone into the soil near the bridge for a fabulous final gasp. 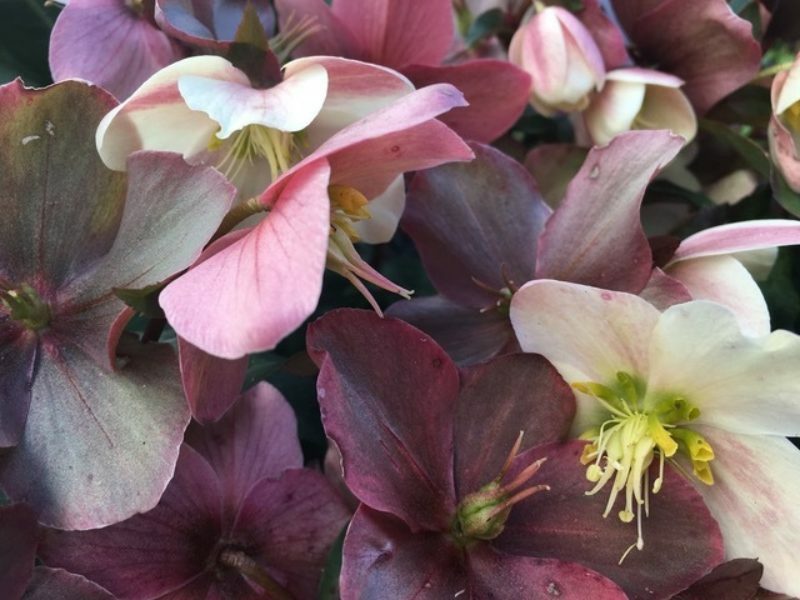 There’s Antraciet, Orange Princess and Apricot Beauty, and a smattering of The Queen of the Night, deep velvety colours, apart from the Apricot, which is more like a sorbet. In the planters are Angelique, White Touch, Danceline, Brown Sugar and Baroque, pinks through to copper, and white shot with green. There are some sweet peas—Wiltshire Ripple and Almost Black—waiting in the wings to be trained up home-made obelisks, but I’m not convinced they’ve had enough hard frost to get going yet. The Apple Tree Beds have been cleared of their autumn cloaks, and an immense number of squishy windfalls. Underneath, bluebell leaves are already in evidence. There’s a lot of mud. In the two small gardens on either side of the porch, there are collections of Things Potted, and many hollyhocks grown from the seed of my mother’s triffidy, eternal originals. She’s been pulling them out of her garden for twenty years, from her Hollyhock Run, and now I’m growing their offspring in mine. Despite the clart and the cold, and the frozen pond, perhaps somewhere Persephone is rousing after all.